Seals and How They Live is an educational film about the life and behavior of the seals found along the East coast of the United States and Canada. It discusses where they live, how they reproduce, what they eat, what they do in their spare time, and how their anatomy helps them to see, hear, and move. Viewers are able to join the seals as they hunt for food, warm up on the rocks, argue with each other, and much more. Filmed both above and below water, the stunning footage really brings the viewer into the world of seals. 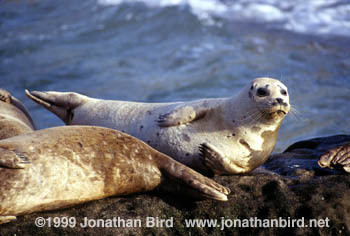 The film closes with a group of seals showing their intelligence and curiosity by investigating the film crew. These adorable animals are sure to delight and fascinate audiences of all ages. Harbor Seals "haul out" of the water at low tide to rest in the warm sun. O.R.G. 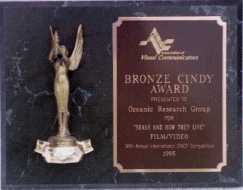 won the prestigious CINDY Bronze award for the film Seals and How They Live, as well as the 1995 CINDY Special Achievement in Cinematography. Only one film can win the Special Achievement award every year!